This Lush V-Neck Crepe Blouse was one of the most popular tops in the #NSale! It comes in several colors and has been restocked in almost all sizes. I love everything about this blouse...the roll tab sleeves, longer length in the back, and deep red color! This top is so versatile and can be worn now (on chilly evenings) and it's perfect for fall and winter. I saw the Topshop 'Jamie' Ripped High Rise Skinny Jeans online and went to Nordstrom to try them on. I was really impressed with the style, fit and soft denim! The skinny ankle is perfect for a variety of shoe types. I styled them here with booties but they look great with tall boots, flats, heels and even fashion sneakers, too! These jeans were sold out but they are now restocked in many sizes! For reference, Topshop clothing typically runs small and I'm wearing a 30x32. To add a little flare to the outfit, I carried my fold over leopard clutch from Le Boutique Shop. 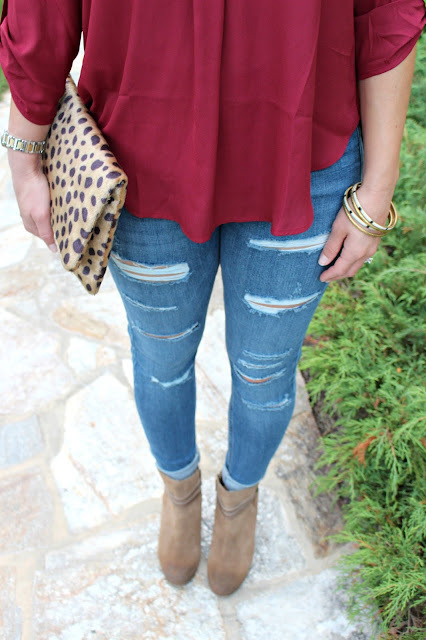 Red and leopard is one of my favorite combos! My tan suede booties were also in the Nordstrom Anniversary Sale. The chunky heel is a good height and the small buckle makes them unique. They are pretty comfy, too! These booties are full price now for $119.95, but I'll keep an eye out for the next sale! For jewelry, I wore simple gold accessories. I've linked everything that's available below! But because of His great love for us, God, who is rich in mercy, made us alive with Christ even when we were dead in transgressions- it is by grace you have been saved. 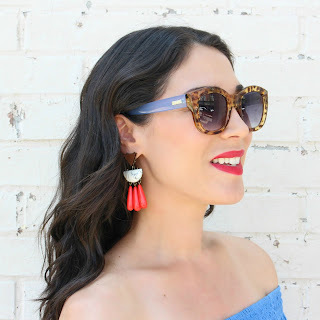 That leopard clutch is a classic! Goes with anything! LOVE that entire look and have that shirt in black and wear it to DEATH! Oh, this is making me long for fall. I Love the color and cut of your top - it is gorgeous and looks great with your distressed jeans and booties! Thanks for sharing while they are still available and linking up with Fabulous Friday.